Hi my name is Ben B and I live in Northern Ireland. I’ve been interested in bonsai for approx 5 years now and the main focus of my pursuit is developing bonsai trees from cuttings or raw garden material. 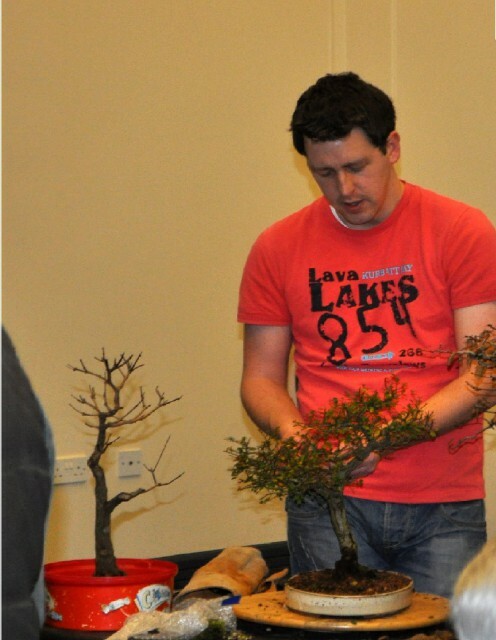 I’m a member of the Northern Ireland Bonsai Society and have learned a lot from being part of it, especially from more learned heads such as Bonsai Baker, Futter with Trees and Bonsai Eejit. I’ve learned that to take a keen interest in bonsai you need either money or patience. I’ve not much spare cash at this stage of my life so looks like I’m taking the patience route. So while things are growing from scratch in the flower beds over the next few years (or more!) I’m planning to develop my skills and knowledge on a range of raw material either bought or dug up from the garden. I don’t intend to focus on one particular size of bonsai as some do, just work on whatever is ready to be lifted at that time. So I have a wide range of material from mame (small) t0 chuhin (large) that hopefully I can develop into something beautiful to look at. Being a bit of a novice, I’d appreciate any comments or advice that you can provide in relation to my posts. I hope to add more to the blog as I get used to the technical side of running it. Hi Ben, I,m just catching up with things and have seen your new blog. Great stuff. You can now quite literally keep us posted with all things bonsai. CU anon. Great start to your blog Ben I will follow with great interest . Sorry about the ice bucket. Hi Ben. I’ve just started into the hobby this past year in Newfoundland, Canada and am also working on scratch material including the larch trees that grow wild in abundance here. I look forward to following your blog. George. Hi George! Thanks for getting in touch. I look forward to seeing what you are working with. There’s a lot of great blogs worth following, especially for newcomers – check out the list of blogs I follow for ideas. Thank you for visiting my blog. I grow all our bonsai trees from young plants and after more than 10 years they still look like young trees. Other people create bonsai from more mature trees, completely butcher the poor things; bend, carve and jin the trunks and branches. The end results are large and amazing looking bonsai trees that look very old. It takes a very good imagination and courage to do this. It is so great to see one like you who is interested in Bonsai in abroad! There is a need for more sites about trees and starting projects which newcomers and /or growers of modest means, or those with of a limited chance of years ahead to achieve their dream, can relate to and learn from others tree progressives etc..Look forward to seeing more from you. . Thanks for the encouragement, Michael.